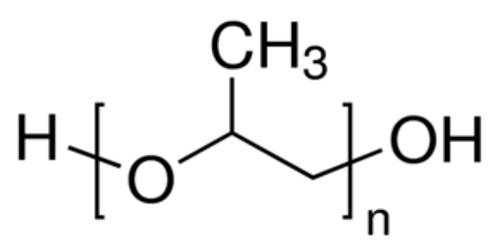 Propylene oxide is a chemical compound that is organic in nature and acts as a chemical intermediate in many chemical processes used in industries. It is an organic compound with the molecular formula CH3CHCH2O. This compound is sometimes called 1,2-propylene oxide to distinguish it from its isomer 1,3-propylene oxide, better known as oxetane. Propylene Oxide easily reacts with compounds which have active hydrogen atoms like amines or acids. It is an essential component used to make several versatile products including propylene glycols, propylene glycol ethers, and polyether polyols. It is a clear colorless volatile liquid with an ethereal odor. Flash point -35°F. Boiling point 95°F. Density 6.9 lb./gal. Flammable over a wide range of vapor-air concentrations. If contaminated, may polymerize with evolution of heat and possible rupture of container. Vapors irritate eyes, skin, and respiratory system. Prolonged contact with skin may result in delayed burns. Vapors heavier than air. Used as a fumigant, in making detergents and lubricants, and to make other chemicals. Propylene oxide production has been to develop and commercialise process routes that do not produce sizeable co-products or do not use chlorine-based chemistry, according to consultants Nexant ChemSystems. Propylene oxide (PO) is made traditionally by chlorohydrin and epoxidation routes but new technologies based on hydrogen peroxide or cumene hydroperoxide have been commercialised. 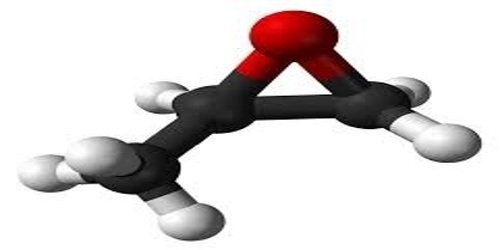 Industrial production of propylene oxide starts from propylene. Two general approaches are employed, one involving hydrochlorination and the other involving oxidation. Almost half of current global PO capacity uses processes based on oxidation of propylene by the organic hydroperoxides ethylbenzyl hydroperoxide (EBHP) and tert-butyl hydroperoxide (TBHP), at about 27% and 15%, respectively. The EBHP and TBHP processes coproduce more tonnage of their by-products than PO; however, despite concerns over the years, the markets for their coproducts continue to support the PO processes. Propylene oxide is used in the production of polyethers and propylene glycol. Acute exposure of humans and animals to propylene oxide has caused eye and respiratory tract irritation. Dermal contact, even with dilute solutions, has caused skin irritation and necrosis in humans. 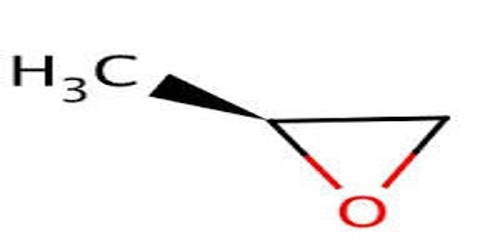 Propylene oxide is also a mild central nervous system (CNS) depressant in humans. Inflammatory lesions of the nasal cavity, trachea, and lungs and neurological effects have been observed in animals chronically (long-term) exposed to propylene oxide by inhalation. 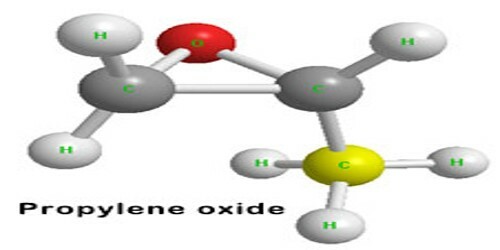 Propylene oxide has been observed to cause tumors at or near the site of administration in rodents, causing forestomach tumors following ingestion via gavage and nasal tumors after inhalation exposure. EPA has classified propylene oxide as a Group B2, probable human carcinogen.